The general rule of thumb is that you should never attempt to cook something new for company. I disregard this rule with a flagrancy that borders on hubris. I figure I have my next kitchen disaster coming to me. Dinner occupies a liminal space between company and family. I cook more elaborately for Dinner than I do for just us at home. But, everyone at Dinner has done our dishes, and they all know where to find the tea things, so they’re not exactly company either. Mostly it’s not hubris, so much as laziness and then impatience, which is I suppose its own kind of hubris. I always plan to make the dish beforehand for just us and then never get around to it because it’s more elaborate than I feel like making on a week night. By that point I’ve been thinking about it for three weeks and I’m craving whatever it is, and it seems perfectly reasonable to chance making it for Dinner. So far this has worked out for me a lot more often than it hasn’t. I think in going on 10 years I’ve only ordered pizza for Dinner twice. Once was because I had a last minute project at work and didn’t get home until we should have been sitting down to dinner. Usually my boss is better about this, possibly because I sometimes bring him leftovers and he’s fond of reaping the benefits of letting me go home on time. The other time it was because I made a recipe that turned out to be so foul the only thing to do with it was throw it away and take the garbage out immediately. There’s also the fact that I’ve been cooking for a long time now. I can’t eat something in a restaurant and then recreate it at home, and I don’t tend to make up a lot of recipes. My mind doesn’t work that way. But, I can usually read between the lines of a recipe and figure out if it’ll work. I can more or less guess at what a finished dish will taste like – if I can’t that tends to be a sign that I should skip the recipe – and whether it’ll work as written. And, while making up recipes isn’t something I can do, I can edit a recipe on the fly to make it do whatever it’s supposed to do if it’s being recalcitrant (unless it’s pastry in which case I throw up my hands in despair). This is to say, Dinner this week was a recipe I’d never made before, but which came highly recommended by both www.smittenkitchen.com and by epicurious reviewers. My comeuppance may be lurking around the corner, but it didn’t make an appearance this week. The Chicken & Mushroom Marsala was not only good, it was also relatively simple. This is always a nice surprise since recipes usually end up being a lot more complicated than they seem, not the other way around. To be honest, I don’t really need the chicken part of the dish. I could just have the mushrooms and sauce over noodles and be perfectly happy because the sauce was divine, but the chicken was nice too. Now my only question is how to use the rest of the bottle of Marsala wine. Split the chicken in half and pat dry. Season with salt and pepper. In a large heavy skillet heat the olive oil and 1.5 Tbsp of the butter until hot but not smoking. Brown the chicken in two batches, transferring to a large plate as browned (you can also lightly flour the chicken before browning if you like). 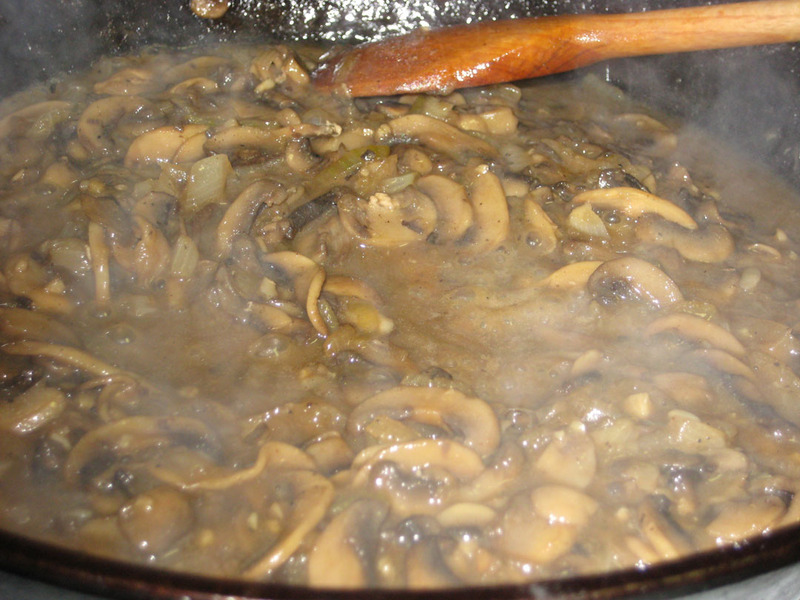 Discard all but 1 Tbsp of the fat from the skillet and sauté the onions, garlic and mushrooms, stirring occasionally until all the liquid from the mushrooms has cooked off/been reabsorbed (10-12 minutes). Add Marsala wine and cook, stirring, until the liquid has almost evaporated. Add the chicken broth and chicken back into the pan (be sure to also add any juices that have accumulated on the plate). Simmer until the chicken is cooked through (about 15 minutes), turning once. Transfer to a platter and cover to keep warm. Simmer the sauce until the liquid is reduced to ½ cup (3-5 minutes). Remove from the heat and stir in the remaining 2 Tbsp butter. Season with salt & pepper to taste. Spoon the sauce over the chicken and garnish with parsley (if using). Notes: I doubled the quantity of mushrooms because I never think that there are enough mushrooms in pretty much anything that calls for mushrooms. I also read the epicurious reviews and upped the quantity of Marsala to ¾ cup. I also added a little lemon juice at the end to give the sauce a little zing. I’m not as fond of kale as I am of swiss chard, but there was no swiss chard to be had at the farmer’s market this week. Not even for ready money. 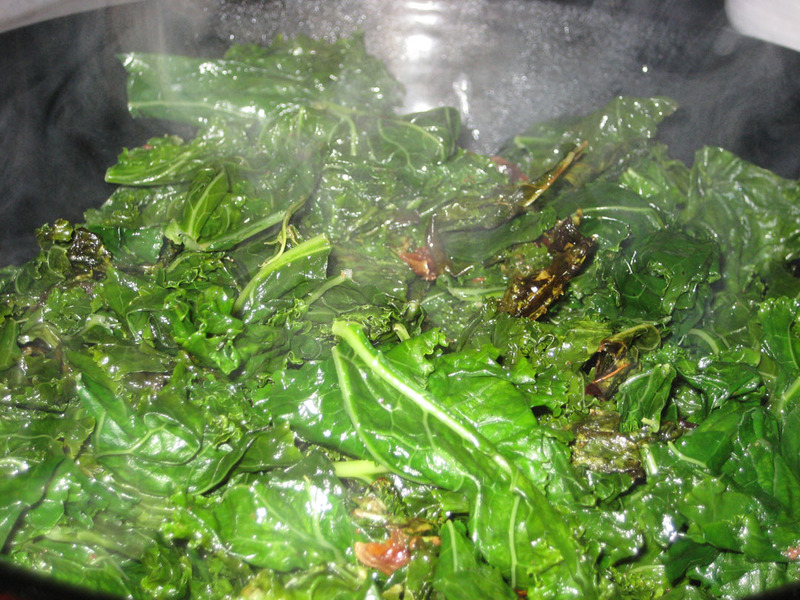 I cooked the kale the way that I cook all dark greens – olive oil, garlic, salt, pepper and a little nutmeg. 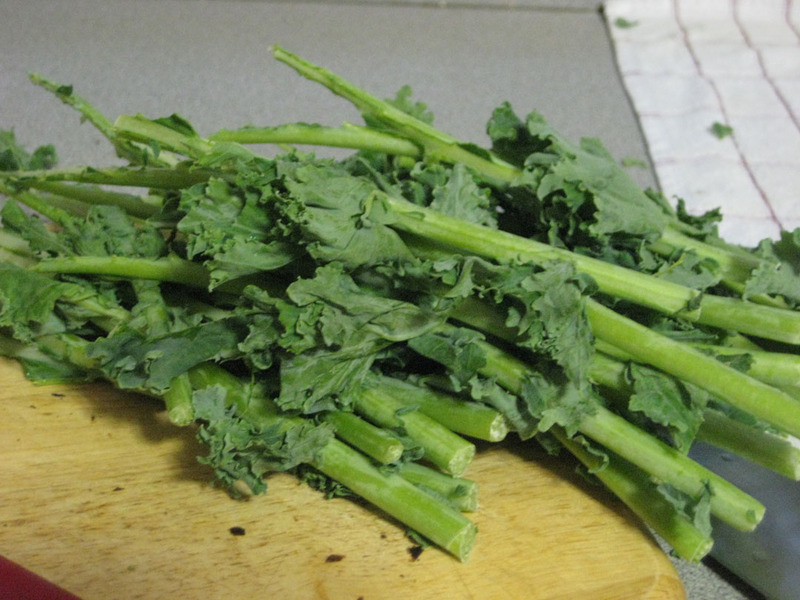 The only difference with making kale or collard greens, is that you have to strip them off the stem before you cook them. Swiss chard, spinach and bok choi are all tender enough that all you have to do is chop them roughly (or in the case of spinach, just wash it thoroughly). Kale and collard greens come on a tougher stem that won’t soften enough in cooking to be palatable. 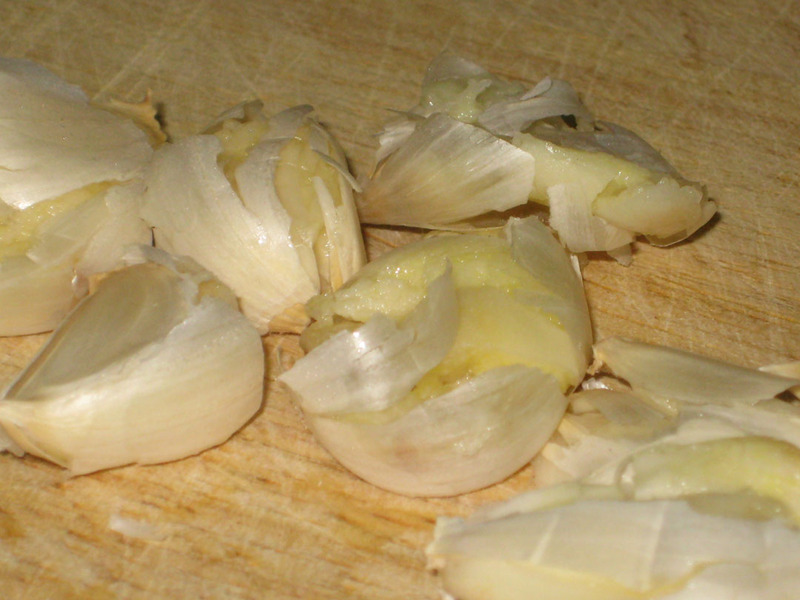 To stem them, just hold the stem at the end and strip your fingers down the stalk and the leaves will pull off easily. hrm. i want to emulate this. yet i have no marsala and no kale. okay, there’s a vague chance i might be able to find marsala, but still. difficult. i wonder if i did bok choi and an asian-type mushroom. could i use an intersting asian-type wine instead? and then the larger question… which kind? You can totally do this with bok choi. I love bok choi and use the exact same method with it when I can find it (mysteriously bok choi season seems to be mid-winter in Boston, I choose not to think too hard about where it’s coming from). 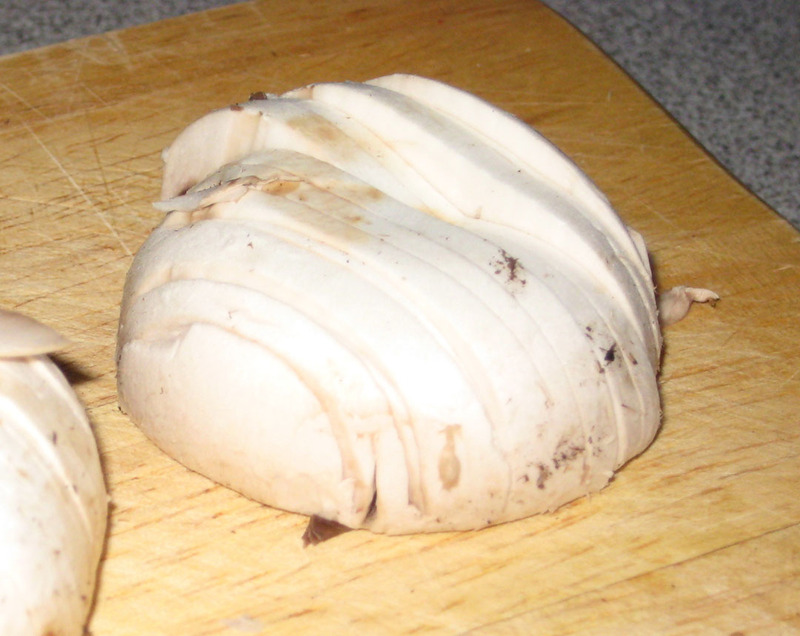 Asian mushrooms would work fine in the chicken dish, they’d probably give it an even better flavor because white mushrooms don’t actually taste like all that much on their own, although they soak up butter and wine quite nicely. I’m not sure about the wine. Marsala is a fortified wine which means that it’s had brandy added to it (or something like brandy). Originally apparently this was done to make it keep longer on sea voyages, and now just because people like the way it tastes. I think you could substitute something else for it. You need something that’s a little thicker than a regular wine, and a little sweeter. You want something like a dessert wine, but not a super sugary dessert wine. I don’t know enough about Asian alcohols/wines to suggest a good substitute.